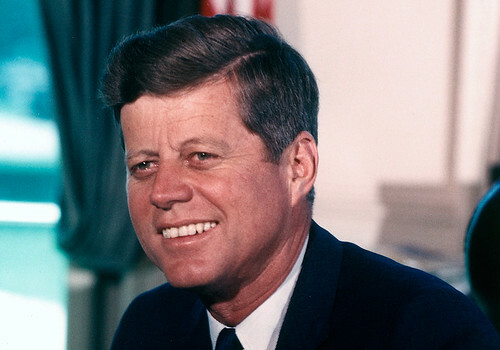 John Fitzgerald Kennedy was the 35th President of the United States of America. His ancestors on his father’s side came from Wexford and on his mother’s side from Limerick. During his time as President he had deal with events such as the Cuban Missile Crisis and the building of the Berlin Wall. He initiated the Apollo Programme which led eventually to the moon landings. John Fitzgerald Kennedy was born in Brookline, Massachusetts on May 29th 1917. He graduated from Harvard with Bachelor of Arts in government in 1940. Kennedy served in the US Navy during World War II and was decorated for heroism. After the war he served as a Democratic Congressman and in 1953 was elected to the US Senate. Following the Presidential election of 1960 Kennedy was inaugurated President of the USA in January 1961 at age 43. He was assassinated while on a visit to Dallas, Texas on November 22nd 1963. John Fitzgerald Kennedy was elected 35th President of the USA when he defeated Richard Nixon by 303 Electoral College votes to 219 in the year 1960 On This Day. Sirimavo Bandaranaike was a Sri Lankan politician. In 1960 she became the world’s first woman Prime Minister upon her party’s victory in the 1960 Ceylon general election. Ceylon became a republic in 1972 and was named Sri Lanka. Sirimavo Bandaranaike served as Prime Minister three times, 1960–65, 1970–77 and 1994–2000. Sirimavo Bandaranaike was born Sirima Ratwatte on April 17th 1916. Her husband Solomon Bandaranaike was elected Prime Minister of Ceylon in 1956. He was assassinated in 1959 and Sirimavo Bandaranaike became the head of his party. 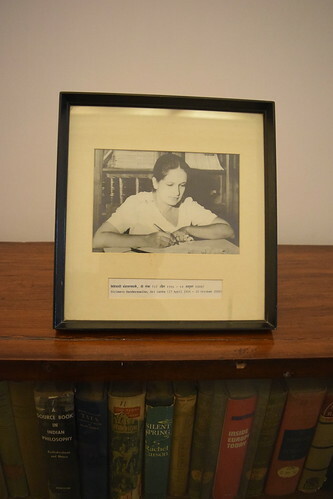 She was elected Prime Minister of Ceylon in 1960 and served in the office until 1965. She was elected as Prime Minister on two further occasions. Sirimavo Bandaranaike was elected Prime Minister of Sri Lanka (Ceylon), becoming the first woman to hold such a position, in the year 1960 On This Day. The Royal Showband was one of the most successful Irish bands of the showband era. 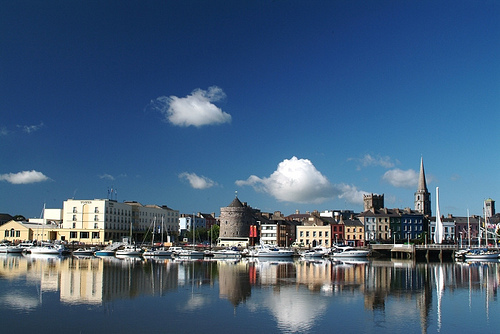 The band which was founded in Waterford city was managed by T J Byrne from Upper Tullow Street, Carlow town. Though a band called the Clipper Carlton is regarded as the first of the Irish showbands, the Royal Showband became one of the most successful bands of the era. The Royal showband had a brief change of name to the Waterford Showband in 1960. The change occurred because two members of the British Royal Family were in attendance when the band made an appearance at the Victoria Palace Theatre in London. The Royal Showband was founded in Waterford in 1957 by a group of young musicians which included Brendan Bowyer, Tom Dunphy, Michael Coppinger, Jim Conlan, Charlie Mathews and Gerry Cullen. The band was launched on September 27th 1957. As the band members all had day jobs they could only perform at the weekend and did not turn professional until 1959. During the following decade the band, with Brendan Bowyer as the lead singer, became the most popular band in Ireland. By 1962 Brendan Bowyer and the Royal Showband were so successful that The Beatles were the supporting act for them at the Liverpool Empire Theatre. 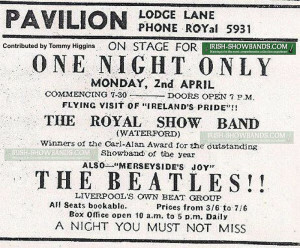 On the poster advertising the concert The Beatles were called ‘Liverpool’s own beat group’. The Royal Showband band toured extensively in Great Britain and the US and had several number one hits, the most popular of which was ‘The Hucklebuck’ in 1965. In 1966 the Royal Showband played at a venue in Las Vegas, Nevada for a four week period. This led to the band performing in Las Vegas for up to six months each year during the following years. In 1970 Brendan Bowyer and Tom Dunphy left to form a new band called the ‘Big 8’. The Royal Showband gave its final performance on July 29th 1971 at the Stardust Hotel in Las Vegas. The Royal Showband had to change its name due to members of the British Royal Family being in attendance at show in the Victoria Palace Theatre in London in the year 1960 On This Day. Adam Clayton is the bass guitarist with the Irish rock band U2. The award winning musician was a founding member of the famous band. Clayton was, for a time after it was established, the manager of U2. Adam Charles Clayton was born in Chinnor, Oxfordshire, England in 1960. He moved to Kenya with his family in 1964 when he was four years old. A year later the family moved again this time to Ireland and settled in Malahide County Dublin. Clayton received his early education in private schools in Dublin but later attended Mount Temple Comprehensive School in Clontarf on the north side of the city. Interested in music from a young age Clayton responded to a notice in Mount Temple looking for musicians to form a band. The band, which came to be called U2, eventually consisted of four members: Paul ‘Bono’ Hewson, Dave ‘The Edge’ Evans, Adam Clayton and Larry Mullen who had posted the notice. For a time Clayton served as manager of U2 until Paul McGuinness took over as manager in 1978. With Clayton as the bass player the band became a top international act and to date have released thirteen studio albums. They have sold over 150 million records worldwide and are ranked one on the best-selling bands in the world. With his band mate Larry Mullen Adam Clayton composed the acclaimed theme music for the movie ‘Mission: Impossible’ starring Tom Cruise. In 1997 the theme music was nominated for the ‘Best Pop Instrumental Performance’ Grammy. To date Adam Clayton has won 22 Grammy Awards with U2. 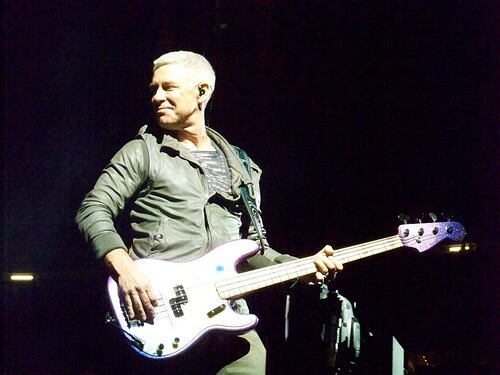 Adam Clayton, bass guitar player with U2, was born in the year 1960 On This Day. The Cold Rolling Mills was a factory based on the Killeshin Road in Graiguecullen near Carlow Town, Ireland. The Cold Rolling Mills produced the steel used in the manufacture of various brands of razor blade, in Ireland and abroad for several years from the late 1950’s onwards. Cold rolling is a process by which the thickness of sheet steel is reduced to a required specification by heating the steel and passing it through rolling machines. 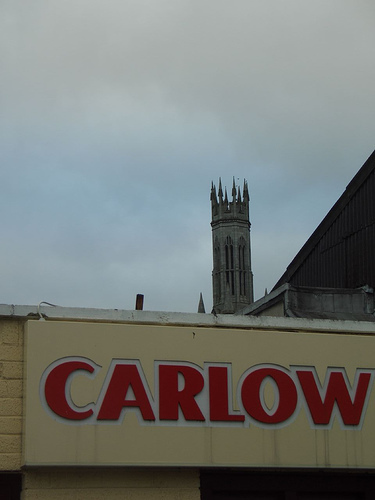 An industry known as the Carlow Blade Factory, which was owned by Steel Products Ltd, had been established in Carlow in 1943. The Carlow Blade Factory was purchased in 1956 by Mr Ovsey Klotsman. Mr Klotsman was born in Pinsk in Belarus in 1900 and was trained in the metal processing industry in Germany. He founded a razor blade manufacturing business in Warsaw, Poland in 1930. He went on to establish other razor blade manufacturing plants in Europe and the Middle East. In 1936 Mr Klotsman opened a factory in Rishon LeZion about 8km south of Tel Aviv in present day Israel. A few years later he established factories in Vilnius, Lithuania, at Alexandria in Egypt and in Carlow, Ireland. 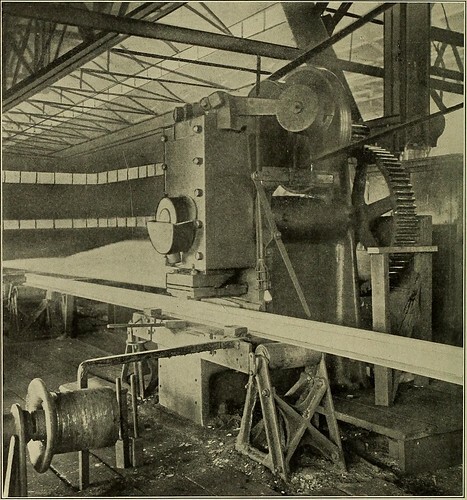 Instead of importing the steel band to make the razor blades at his Carlow factory, Mr Klotsman decided to establish the Cold Rolling Mills to produce this material. As a result the Cold Rolling Mills opened in Carlow in 1957. The Mills supplied the prepared steel to both the Blade Factory in Carlow and to Mr Klotsman’s other plants abroad. Mr Klotsman died on July 2nd 1967 and the factory in Carlow was sold shortly after his death. In 1960 Mr Jim Larkin TD in a Dáil question, sought information on newly established industries in Ireland. In reply the Minister for Industry and Commerce gave details of over eighty such industries one of which was The Cold Rolling Mills in Carlow. The Cold Rolling Mills factory in Carlow was mentioned by the then Minister for Industry and Commerce Mr Erskine Childers in answer to a Parliamentary Question in the year 1960 On This Day.